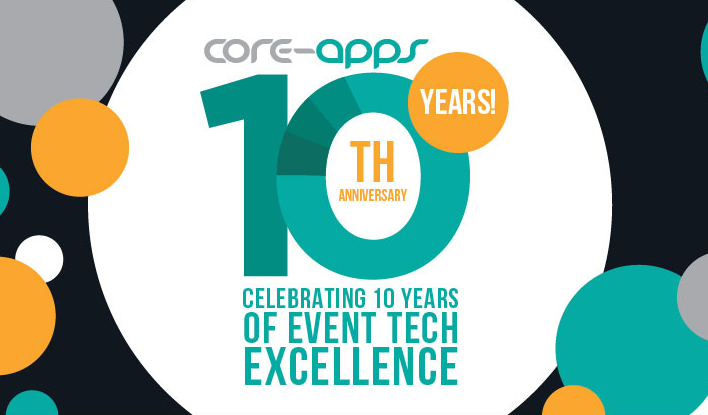 Arnold, MD, March 20, 2019 – Core-apps, the leading technology supplier to the trade show and events industry, announced today their 10 year anniversary and launch of their celebratory landing page content experience. Core-apps was the first company to create a mobile app platform, tailored specifically for the event industry. Core-apps was founded in March, 2009 by Jay Tokosch, Jesse Snipper and Jonathan Johnson. As they celebrate their ten-year mark in the event industry, they are taking the opportunity to reflect on the ups, downs and paradigm shifts in the field of event technology. The landing page content experience is an amalgamation of event technology trends, insight and Core-apps company history. Jay Tokosch, Core-apps CEO, says that he is grateful for the opportunity to have worked with so many event organizers over the last decade and that this effort is a way of packaging up that experience as a giveback. Core-apps is one of the leading technology suppliers to the trade show and events industry. Core‐apps delivers award winning mobile apps, event management software, event registration, kiosks and augmented realty solutions to over 800 clients around the globe. For more information, please visit www.core-apps.com.